The Centralized Instrumentation Facility Laboratory, equipped with high value sophisticated instruments, has been created in order to cater to the needs of different departments and for maximum utilisation of instruments. The facilities are extensively used by Post Graduate Students, Doctoral and Research Scholars. 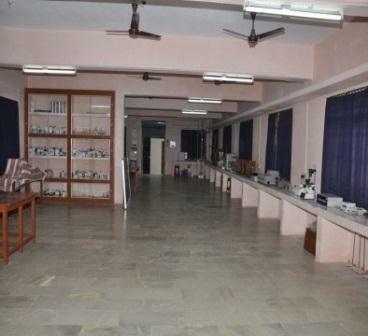 Centralized Instrumentation Laboratory was established in the year 2006. Research activities are carried out by the research scholars, both M.Phil. and Ph.D. in the laboratory by utilizing the available instruments. Many ongoing research works are in process by the research scholars of the departments of Microbiology and Biochemistry. Biominin Laboratories utilize the instruments for soil testing and for all the other activities. The students of various departments were also given instrumentation training for three years to provide students with a broad technical training in all major scientific disciplines for supporting their study. Our main intention is to strengthen the candidates to know the scientific concepts. We want to provide hands on experience in a modern sophisticated laboratory setting which will develop the technical skills in current industries. To pursue a competitive research in order to discover and fulfill the global needs in Life Sciences. The students of the departments of Microbiology, Biochemistry and Biotechnology carried out a number of research works in the field of Microbiology, Biochemistry, Biotechnology, Soil Microbiology, Pharmacognosy, Biocontrol, Food Microbiology, Biodiversity, Industrial Microbiology, Medical Microbiology, Animal Biotechnology, Agriculture Microbiology, Environmental Science, Plant Biotechnology, Zoology, Herbal Technology, Soil chemistry, Nanotechnology, Nutritional Biochemistry etc. Sufficient sophisticated instrumentation laboratory provides all the facilities to do the research in any scientific area. HPLC, Gas Chromatography, BX-51 Microscope, Phase Contrast Microscope, Inverted Tissue Culture Microscope, Gel Documentation System, Thermal Cycler, Atomic Absorption Spectrophotometer, UV-Vis Spectrophotometer, Soxhlet Extraction Unit, Semi Auto Analyser, Bioreactor and Flame Photometer. Presently, 32 Doctoral Research Scholars from the Microbiology and Biochemistry are working regularly in the lab. The fruitful results of the Bioinstrumentation training conducted has given us the spirit to start the certificate course on Bioinstrumentation and Microscopic Techniques to arrange hands-on training to the students of various disciplines including Microbiology, Chemistry , Biochemistry, Nutrition and Dietetics and Physics. For providing the institution-industry interface several MoU’s has been signed with different industries and many institutions. 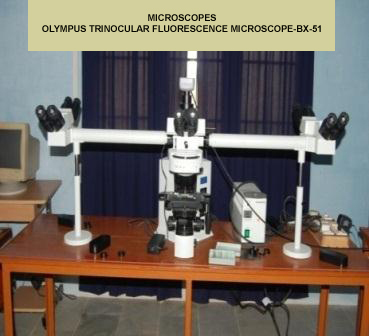 An inverted microscope is a microscope with its light source and condenser on the top, above the stage pointing down, while the objectives and turret are below the stage pointing up. It was invented in 1850 by J. Lawrence Smith, a faculty member of Tulane University (then named the Medical College of Louisiana). Working with live cells involves providing some sort of medium to facilitate the growth of these cells. Whether this involves petri dishes or some other vessels, this necessitates a live cell microscope (tissue culture cell microscope) that will accommodate them. It also requires microscope objective lenses with longer working distances to be able to focus on the live cells through the bottom of these vessels. 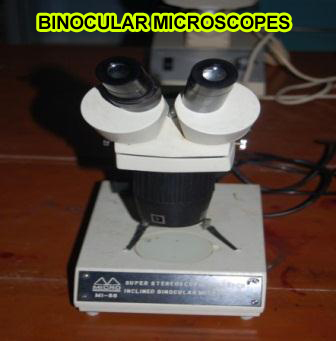 In many situations, viewing these with a live cell microscope will require only 100X or 200X total magnification. 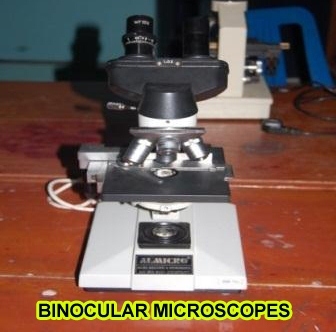 However, in some situations, up to 400X magnification may be required. HPLC has contributed to analytical solutions in diverse fields such as Pharmaceuticals, foods,life sciences, environment, forests, etc. High Performance Liquid Chromatography provides reliable quantitative precision and accuracy along with a high linear dynamic range to aloow determination of API amnd related substances in a single run.A convenient method for sample preparation for solid dosage forms is dispersion in water or aqueous media modified with acetonitrile or methanol. HPLC offersseveral possibilities for separation of chiral molecules into their respective enantiomers. These include precolumn derivatization to form diastereoisomers. Alternately, specialty columns prepared with cyclodextrins or special chiral moieties as stationary phase may be used. In short HPLC, particularly reverse phase HPLC is the most popular choice for quantitative analysis in the pharmaceutical industry. In general, substances that vaporize below 300˚ C (and therefore are stable upto that temperature) can be measured quantatively. The samples are also required to be salt free; they should not contain ions. Very minute amounts of a subatance can be measured, but if it is often required that the sample must be measured in comparison to a sample containing the pure, suspected substance known as a reference standard. In practical courses at colleges, students sometimes get acquainted to the GC by studying the contents of lavender oil or measuring the ethylene that is secreted by Nicotiana benthamiana plants after artificially injuring their leaves. These GC analyse hydrocarbons (C2-C40+).In a typical experiment, a packed column is used to separate the light gases, which are then detected with a TCD. The hydrocarbons are separated using a capillary column and detected with a FID. 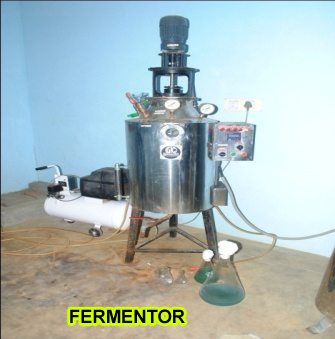 A fermentor is the equipment, which provides the proper environment for the growth of a desired organism.It is generally a large vessel in which, the organism may be kept at the required temperature, pH , dissolved oxygen concentration and substrate concentration. Different models of fermentors are available depending upon the necessity. A simple version model contains steam generator, sterilization process devices and agitator. A sophisticated fermentor contains pH regulator, oxygen level regulator, anti-foam device, temperature controller, etc. 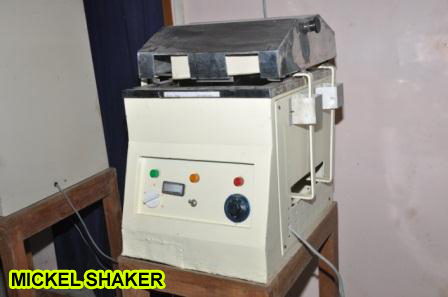 A thermostatted shaker, as used in biochemistry work. A shaker is a device used in chemistry and biology laboratories to stir liquids. A typical shaker has a table board that oscillates horizontally, powered by an electric motor. The liquids to be stirred are held in beakers, jars, or Erlenmeyer flasks that are placed over the table; or, sometimes, in test tubes or vials that are nested into holes in the plate. Orbital shakers also exist, that shake the vessel in a circular fashion. Shakers have largely been replaced by magnetic stirrers for many purposes, but are still favoured for some situations, such as those involving large volumes. 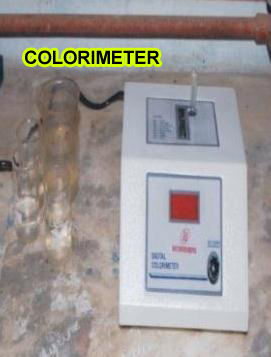 A colorimeter is a device used in colorimetric. 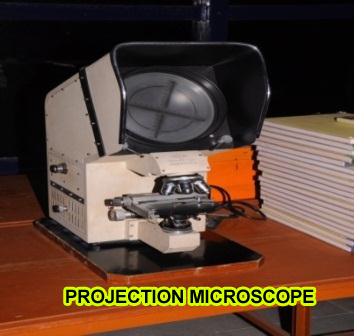 In scientific fields the word generally refers to the device that measures the absorbance of particular wavelengths of light by a specific solution. This device is most commonly used to determine the concentration of a known solute in a given solution by the application of the Beer-Lambert law, which states that the concentration of a solute is proportional to the absorbance. 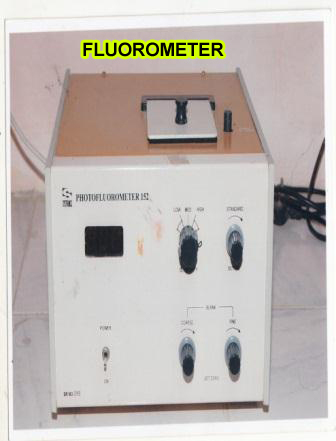 A fluorometer or fluorimeter is a device used to measure parameters of fluorescence: its intensity and wavelength distribution of emission spectrum after excitation by a certain spectrum of light. 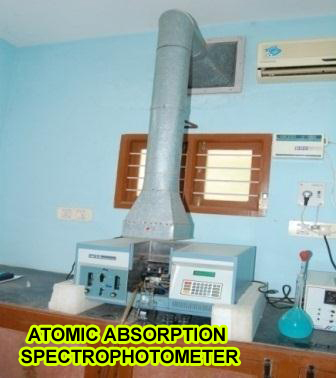 These parameters are used to identify the presence and the amount of specific molecules in a medium. Modern fluorometers are capable of detecting fluorescent molecule concentrations as low as 1 part per trillion.Fluorescence analysis can be orders of magnitude more sensitive than other techniques. Applications include chemistry/biochemistry, medicine, environmental monitoring. For instance, they are used to measure chlorophyll fluorescence to investigate plant physiology. 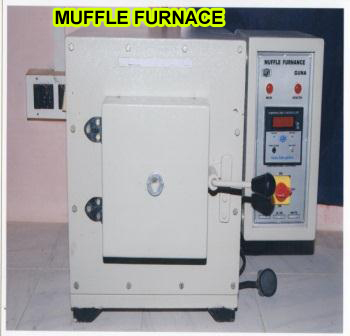 A muffle furnace (sometimes, retort furnace) in historical usage is a furnace in which the subject material is isolated from the fuel and all of the products of combustion including gases and flying ash. After the development of high-temperature electric heating elements and widespread electrification in developed countries, new muffle furnaces quickly moved to electric designs. Today, a muffle furnace is (usually) a front-loading box-type oven or kiln for high-temperature applications such as fusing glass, creating enamel coatings, ceramics and soldering and brazing articles. Deep Freezer solutions offered by us are backed by latest process technology support and are designed for ensuring safe and secure storage of biological samples in working areas like biotech & life science labs, clinical research institutes as well as at other health care centers that require deep freezing of medical & pharmaceutical serums, vaccines, specimens and blood components. With these freezers made available with temperatures up to -20°C,– 40°C and -80°C, these are able to match up with the different deep freezing storage requirements. 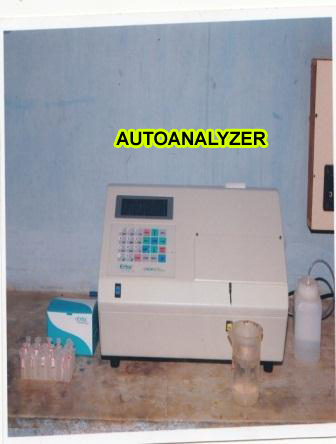 Auto analyzer is an automated analyzer using a special flow technique named "continuous flow analysis (CFA)", invented in 1957 by Leonard Skeggs, PhD and first made by the Technicon Corporation. The first applications were for clinical (medical) analysis. The AutoAnalyzer profoundly changed the character of the chemical testing laboratory by allowing significant increases in the numbers of samples that could be processed. The design based on separating a continuously flowing stream with air bubbles largely reduced slow, clumsy, and error prone manual methods of analysis. Flame photometry is an atomic emission technique which may be regarded as the simplest of atomic spectroscopic methods and is very similar to the flame test which is applied for detection of alkali metals. 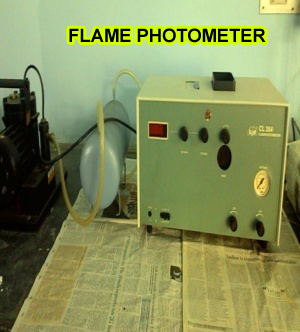 Flame photometry is good only for elements that are easily excited and do not require very high temperatures (Na, K, Li, Ca are the most widely determined atoms by this technique). Electronic Chemical balance is a class of balance designed to measure small mass in the sub-milligram range. The measuring pan of Chemical balance is inside a transparent enclosure with doors so that dust does not collect and so any air currents in the room do not affect the balance's operation. This enclosure is often called a draft shield. 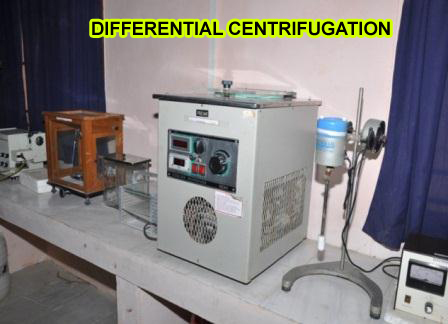 Differential centrifugation is a common procedure in microbiology and cytology used to separate certain organelles from whole cells for further analysis of specific parts of cell. In the process, a tissue sample is first homogenised to break the cell membranes and mix up the cell contents. The homogenate is then subjected to repeated centrifugations, each time removing the pellet and increasing the centrifugal force. Finally, purification may be done through equilibrium sedimentation, and the desired layer is extracted for further analysis. 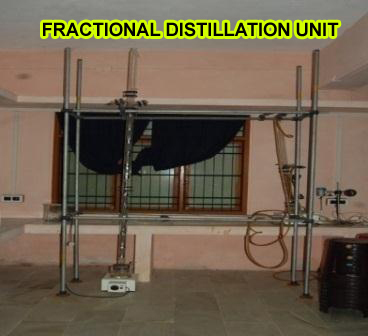 Fractional distillation unit is used in the downstream processing of industrial production of products. 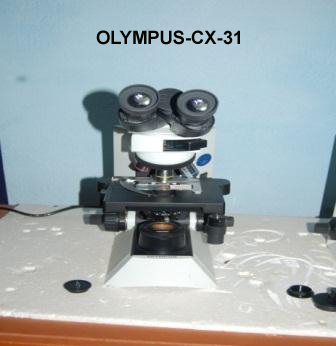 It is used for the separation of different compounds in a crude sample extracted during the production process. Incubators providing controlled conditions (light, temperature, humidity, etc.) 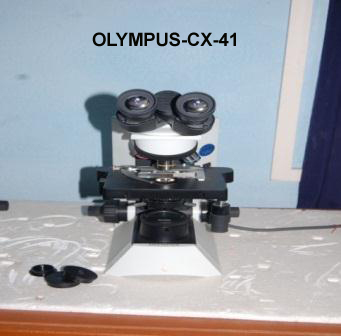 required for the growth and development of microorganisms. Multiplication of starter culture can be done in this instrument. 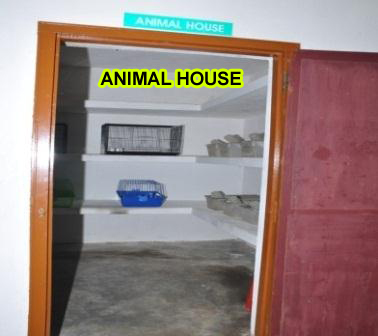 Animal house is used for rearing the animals that are subjected to experimentation. All the favourable conditions needed by the animals are provided in the house. Feeds are given properly and maintained with caution and care.